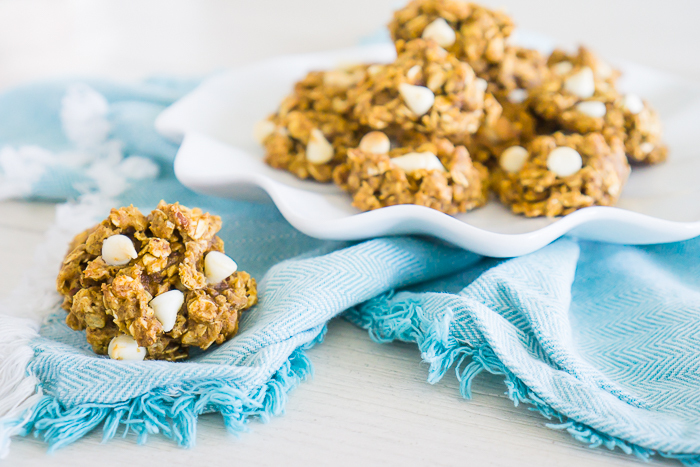 Combine the perfect fall flavors of pumpkin, oatmeal, nutmeg, and cinnamon into delicious White Chocolate Chip Pumpkin Oatmeal Cookies that are so addicting you will want them with your coffee in the morning! It will be one of your new fall cookie favorites! 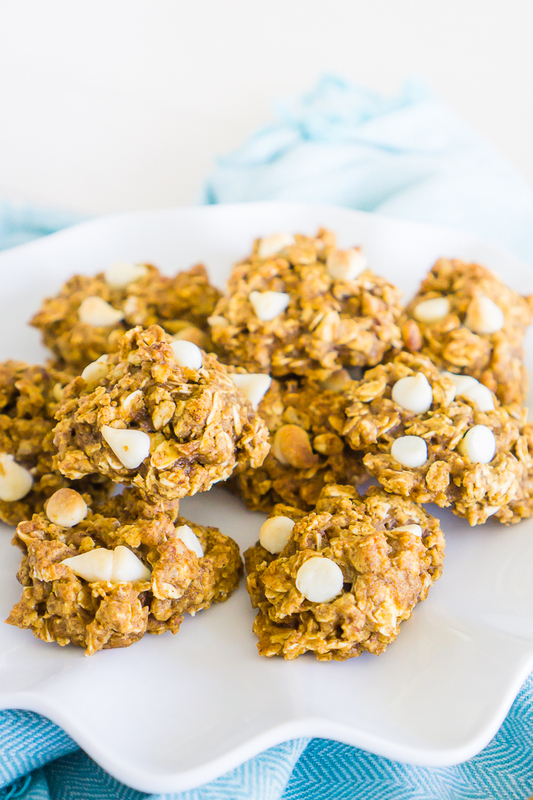 Delicious White Chocolate Chip Pumpkin Oatmeal Cookies You’ll Even Want for Breakfast! I grew up in a pumpkin free house. Pumpkins were meant for carving but definitely not for eating. It wasn’t until I sat in a Starbucks after school one day my junior year of high school that I had my first bite of pumpkin, and my life was changed forever! Alright, so a little dramatic but that is how much I love pumpkin. It has such a rich flavor and pairs so well with all of my favorite spices: cinnamon, clove, all spice, and nutmeg. Pumpkin is definitely a fave in our house and with our toddler, especially my Spice Glazed Pumpkin Scones, Pumpkin Snickerdoodles and these White Chocolate Chip Pumpkin Oatmeal Cookies. So the name is a bit of a mouthful, but they are so delicious and healthier than many of my baking recipes with less butter and sugar than most fall cookie recipes. Especially oatmeal cookies which tend to require more butter than other types of cookie. You would think the oatmeal would make it better for you, but I just always feel guilty eating them. Not with this recipe. The entire batch only has 2 tablespoons of butter. That’s it! The canned pumpkin (not pumpkin pie filling!) is what works to make these pumpkin oatmeal cookies super moist, so the rest of the stick of butter can stay in the fridge and off the waistline. Now, of course, if I was trying to be super health conscious, I would also take out the white chocolate chips, but truth be told I just love them too much! Okay, so yes I had one for breakfast two mornings in a row, but they really are that good! I promise! Easy Pumpkin Butter <— Perfect for baking! 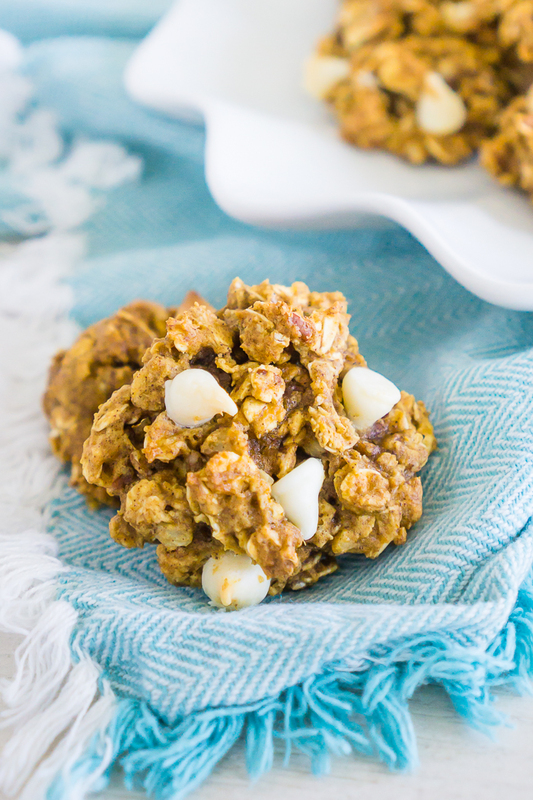 Time to Bake these Tasty Pumpkin Oatmeal Cookies with Optional White Chocolate Chips and Pecans! The white chocolate chips make them look so yummy! Thanks for linking up to the Tasty Tuesdays Linky Party at Creative K Kids. I have pinned this post to the Tasty Tuesdays Linky Party.